This is the Pineapple News main window. The colors might be a little loud for you, but don’t worry, they’re customizable. Note that there are five news servers configured, four of them “folded up” at the moment. The numbers in parentheses are the total unread messages for each newsgroup and server. The column headers in the headers view are resizable and can be removed altogether if desired, and there are several other columns that can be added as well. The button on the right side of the header bar with the graphics icon indicates that the post being viewed contains a binary attachment. Clicking on the button will give you a menu that will let you view or save the file. This is where you enter information about your news server. It’s filled in with info for my USENET alter ego, Johnny Favorite. 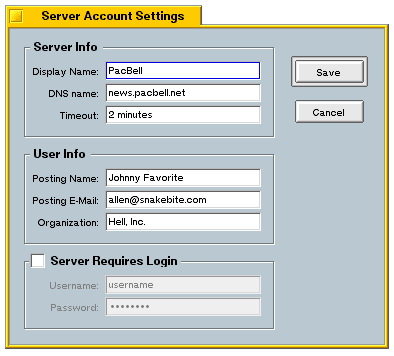 Pineapple News is a USENET newsreader for BeOS. It is primarily an offline reader, but it has features and user interface conventions that make it easy to use online also. You can tell by looking at it that I have been using Outlook Express, can’t you? In most cases I couldn’t think of a paradigm that worked any better, so I stuck with the tried-and-true three-pane interface. The program saves USENET articles in what I call “Pineapple Message Format” files. PMF files have the usual complement of BeOS attributes that allow you to perform queries on them and to use the Tracker as a suitable substitute for viewing a folder full of PMF files. 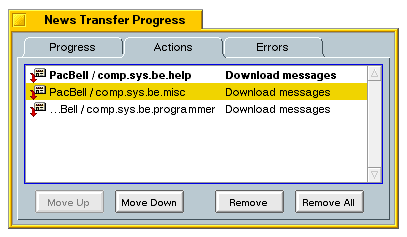 This is the first and only major BeOS application I have ever released to the public. In retrospect, I can see I should have picked something a bit less ambitious to start with. But I really wanted to have a newsreader that I wrote myself so that I could make it behave exactly the way I think is correct. This is where you select the newsgroups you want to subscribe to. You can use wildcards to narrow your search. 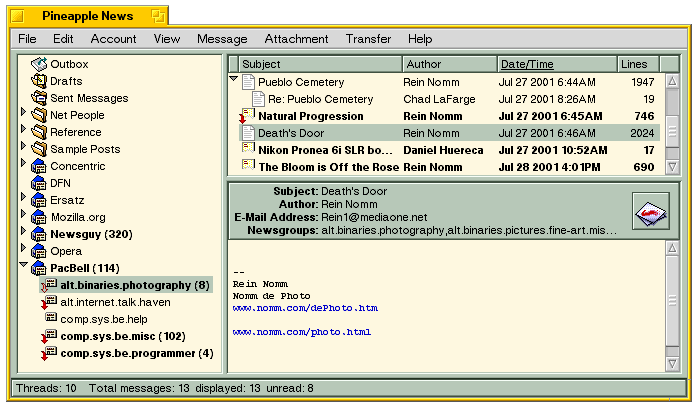 This was one of the first windows I wrote, and my first try took about five minutes to load in a list of 40,000 newsgroups. I eventually got it down to just a second or two. The program was first released in August 2000. Since its initial release, it has improved substantially in download speed, character set support, and MIME message handling. It looks for URLs in messages it displays and turns them into clickable links. It can display HTML posts in a NetPositive replicant. It can decode binary attachments, and it has a killfile, but those are “advanced” features only available to those who buy the program. There is no printing yet. I’d like to do spell-checking eventually, if I can figure out how to use somebody’s library or engine or something. This window shows the queue of actions that Pineapple News is working on. The action in bold at the top is the one currently being executed. The buttons at the bottom allow you to re-order actions or to remove ones that you’ve changed your mind about. That topic is covered on the registration page. The BeOS version of Pineapple News has been on hold for a few years now. I issue new versions when older versions expire, but I haven’t added much in the way of new features. Since Be, Inc. is no more, I plan to keep Pineapple News compatible with Haiku and YellowTab’s Zeta. One of these days, when I get finished with Pineapple News for Mac OS X and Pineapple Mail, I might get around to adding a few new things to the BeOS version as well.